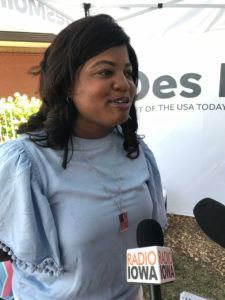 Deidre DeJear — the Democratic candidate for secretary of state — said she has steered clear of commenting on the court dispute over Iowa’s voter ID law because she didn’t want to confuse voters. 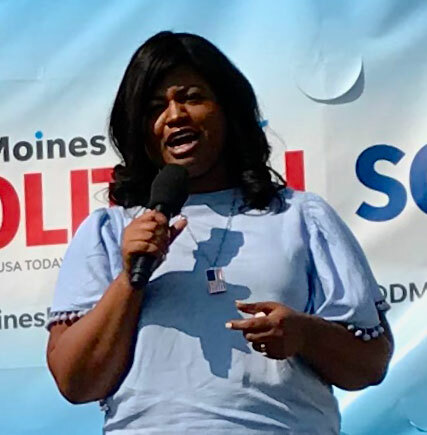 DeJear said some of her campaign plans have been “on pause” — waiting for the Iowa Supreme Court to issue its ruling. DeJear, though, favored the longer, 40-day period of early voting. The Iowa Supreme Court today struck down a district court judge’s injunction, so the new state voter ID law’s 29-day-long period for early voting is now set. DeJear spoke at The Des Moines Register’s “Soapbox” at the Iowa State Fair today. She stressed election security and warned there are people who are trying to impede Iowa’s voting process. Deidre DeJear talks with reporters at the Iowa State Fair. DeJear said one of her top goals if she’s elected Iowa Secretary of State will be to get the 400-thousand Iowans who are eligible to vote registered to vote. DeJear faces Republican Secretary of State Paul Pate in the November election.